Like thousands of Australians during World War I, Ernest Watts received his tragic news through the office known as ‘Base Records.' This letter was just one in a series of correspondence that lasted the duration of the war and well into the post-war period. Every letter was answered with patience and courtesy and every response carried the same signature: J.M. Lean. 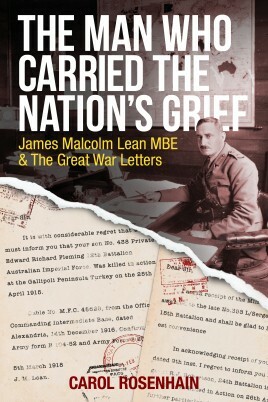 The Man who Carried the Nation’s Grief describes the extraordinary work of James Lean, whose office at times received over 100 letters a day from distressed families. The letters selected by author Carole Rosenhain are quoted verbatim in all their rawness; showing the families’ grief, anger and disbelief, together with the devastating wounds that would often never heal. The chain of correspondence between Lean and the family would often last well beyond the Armistice of 1918. For one shattered father, the fate of his missing boy would never be resolved, his son’s final resting place only discovered in Pheasant Wood almost a century after he met his death.